so far i've transitioned out of my fall wardrobe by sporting some brights & florals. i've also put my fall scent away for a light spring floral scent. my iphone, on the other hand, is one thing that is still out of season. i don't have a picture i can show, but it's a dark navy python case. i loved it when i bought it back in december, but i think it's time for a wardrobe change. do you like to play dress up with your phone? OMG, I love these cases, and want them!!! your blog is sooo cute with so much style! i especially love your last outfit. Your post sent me to society6 and I spent some time there! 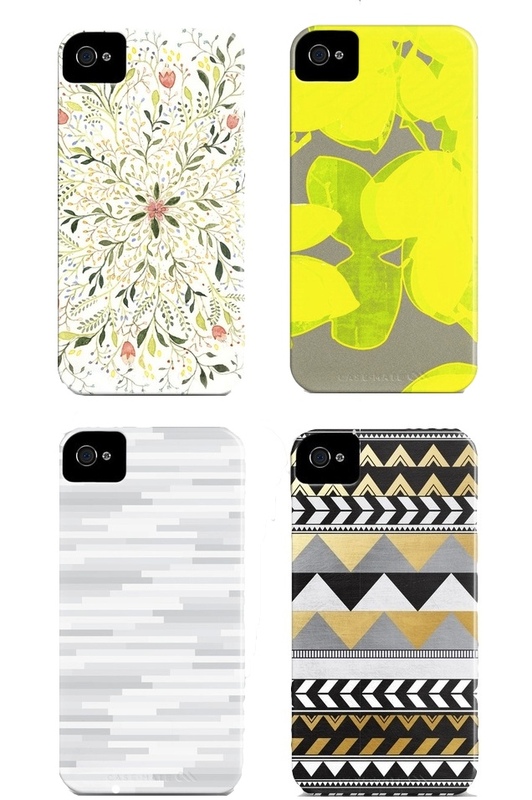 And I can say you definitely chose the very best of the available cases! Although it's a tough choice I'd go with the white one!!! It's so classy in a contemporary way! I now follow you via GFC and Bloglovin and I hope you will follow me back! i want the yellow one! happy weekend gorgeous! xO!